DO YOU WANT TO IMPROVE YOUR SHOULDERS? Nothing looks more impressive than a massive pair of shoulders on a bodybuilder. 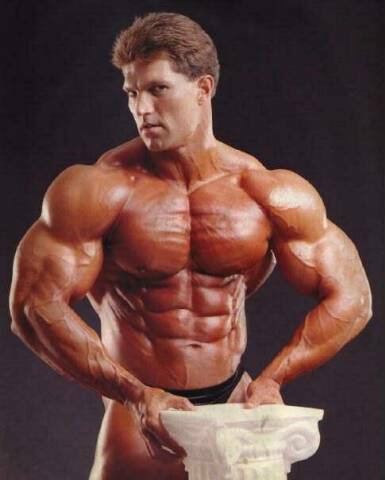 Look at bodybuilders like Gary Strydom (picture left), Kevin Levrone and Jay Cutler, these guys are known for huge wide thick shoulders, they look like melons on the end of their clavicles! Obviously they have very good genetics to build them but also they have worked them very hard with the bodybuilding basics. In this article we will just concentrate on the deltoids, the muscle at the end of your clavicles. As in the name you will find three heads to this muscle, the anterior deltoid (the front), medial deltoid (side and also what will make you nice and wide) and the posterior deltoid ( the rear). All three heads will need to be developed equally to create a nice balanced look to the delts from all angles using a mix of compound exercises and isolation exercises. I see quite a few common mistakes in the gym when it comes to training shoulders and I dont not want to see you making the same mistakes ok? The main one is too much weight. I see this all the time, especially with the isolation movements. I see people performing lateral raises with the big dumbells just swinging them up, using the legs and momentum, you’ll find the delts are hardly doing any work at all! Lateral raises work the medial (side head) of the delts and they are quite a small muscle so keep your exercise form strict and work your muscle and not your ego and this applies to every other muscle in the body! When you do your exercises, and this applies to all bodyparts, use full range of movement. It’s a pet hate of mine when I see people train, pile the weight on whatever exercise they are doing and then move the weight a few inches. As I said earlier you want a mix of compound and isolation exercises to work the delts. I will give you a great basic shoulder workout for you to do for your next shoulder workout ideal for beginners and intermediate bodybuilders. A basic mass builder and the mainstay of my current shoulder workout. You can do this with the bench up or down but will find as you get stronger it will be best to have the bench up so you can lift maximum weight ( in good form of course!). Make sure you keep your spine in neutral and that mid section pulled in to activate your core muscles to protect your lower back. And remember full range of movement. This is an isolation exercise but great for adding some width to the medial head of the delt. When you do this lean ever so slightly forward with the back still in neutral, and with the elbows slightly bent raise your arms out to the side and slightly forward, keeping the dumbbells parallel to the floor. This will be a bit different to what you see in the gym but you will feel it right in the medial head, just be strict with the form and don’t worry about the amount of weight you are lifting because if you are doing it properly you will feel it with just a few kg’s! Another isolation exercise but focusing on the posterior head of the deltoid. Bend at the hips so you are almost parallel to the floor and keep the spine in neutral (if you have trouble keeping neutral in this exercise then perform it laying face down on a slight incline bench) with the arms slightly bent bring your arms out to the sides and squeeze the shoulder blades together and do not shrug your shoulders while doing it, if you are the weight is too heavy. Perform 3-4 sets of 8-12 reps of each exercise, strict form and weights you can handle properly. It’s a very basic routine but one that will work well. There are no magic exercises, stick with the basics and they will reward you plenty! Newer PostTeam Natural Physiques New Champion. Dressage Rider Sofie Butchart! Older PostCAN'T GET THEM CALVES TO GROW?